Those that work in an office can spend upwards of 7 hours per day sitting in the same spot. This means that they are doing a lot of repetitive tasks and engaging in behaviours that may cause ergonomic injuries. In recent years, a greater emphasis has been put on ergonomic tools and accessories. Employees, managers, and business owners are all taking greater ownership over their wellness in the workplace. 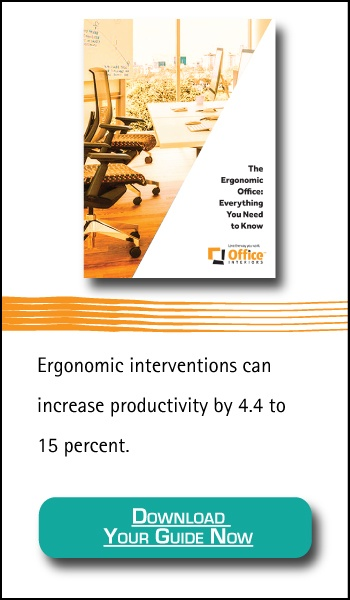 Since ergonomic injuries are one of the most common chronic injuries sustained in the office, finding the right tools and accessories to help improve office ergonomics is essential. We’ve put together this list with some of the most popular products available. The average office worker spends as much as 1700 hours per year sitting at their desk. That is a significant portion of your life; you had better hope you enjoy your task chair! It is imperative that the chair you spend up to a third of your time interacting with is helping, not hurting your body. There are plenty of great ergonomic task chairs that you can choose from, but there are a few features you should ensure are included in your next chair. A quality chair starts with a comfortable seat and is the correct height for your body shape and desk. Your back and arms also need to be supported, so buying a chair with adjustable armrests and lumbar support is crucial. As mentioned, office workers tend to spend a lot of time sitting throughout the day. This has become a critical health concern with some people even calling sitting the new smoking. In fact, researchers suggest that office workers should spend 50% of their time standing and only 50% of their time sitting. Unfortunately, that’s not feasible in most traditional workstations. This is why the sit/stand desk is so essential for office ergonomics. These desks allow employees to seamlessly move from sitting to standing without interrupting workflow or disturbing the people around them. Carpal tunnel can be anywhere from a mild annoyance to severe impediment for people who work in an office all day. Worst of all, the pain can last long after you clock out for the day. How can you relieve and prevent carpal tunnel pain? Stretching and strengthening the muscles in the wrist and forearm is the best way to avoid chronic pain. Look for ergonomic accessories that help you stretch this area and use them several times per day. If you are already experiencing carpal tunnel pain, then you may want to consider a wrist splint and reusable ice packs to help relieve the pain. You may find that wearing the brace throughout the night greatly helps with pain throughout the day. You have a perfectly good desk right in front of you, so it only makes sense to use it for your keyboard and mouse, right? The truth is that many desks are too high or too low for a keyboard and mouse. An adjustable pull out tray that attaches to the desk will allow you to sit with a posture comfortable for both your back and wrists. Ideally, you want your arms to rest comfortably with a 90-degree bend at the elbow when typing or scrolling. A desk that’s too high or too far away can cause you to reach for the mouse and keyboard. Over time, this can cause neck and shoulder pain. A prevalent ergonomic hazard in the workplace is poor posture, such as slouching or leaning forward. Often, this is caused by incorrect monitor height or position. Ideally, the center of your monitor should be just below eye level so that the first line of text is aligned with your eyes. Some monitors don’t allow enough height adjustment while laptops are essentially fixed where they sit. So, are you doomed to slouch forever? Laptop stands and monitor stands or arms help bring the display you are using to eye level. As a result, you can sit with proper posture while still being able to view the display you are using easily. Best of all, these stands are very affordable and effective ergonomic accessories. You don’t have to break the bank for better posture at work. If you work with both a computer monitor as well as papers on your desk, then you may find yourself straining your eyes or developing headaches when alternating from one to the other. This is because your eyes require significantly different light levels when viewing a backlit monitor as a physical piece of paper. Our eyes prefer a lower or more moderate light level when reading from an illuminated computer screen but require bright and clear light to read a paper document. This variance in optimal light levels can lead to eye strain and headaches. A task light is one of the most important ergonomic accessories as it helps reduce eye strain while working. Without these lights, you may notice headaches, eye fatigue, and other symptoms after a long day of work. Office ergonomics are an important factor not only when trying to enjoy your job but also continuing to do the things you love to do outside of the office. Chronic pain from work can extend into your personal life and affect the way you live. 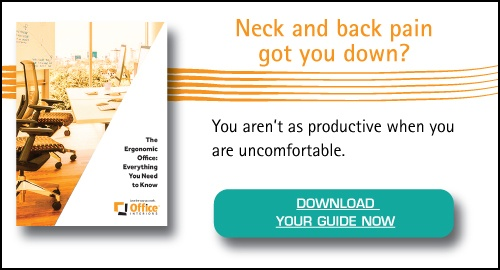 If after reading all the way to the bottom of this post you still want to learn more about office ergonomics you can download our comprehensive Guide to Office Ergonomics. If you have a specific question about ergonomics or want someone to take a look at your workstation, ask us today! Is your team less productive because of muscular soreness?